This post is the continuation of our Kyoto Tour last June. Read the first part of the tour here. The shrine was built in 1895 on the occasion of Kyoto's 1100th foundation anniversary and is dedicated to the spirits of the emperors who reigned the city, thus making it one of the newest religious sites in Japan's old capital. Heian Shrine also boasts a beautiful torii (sacred gate) arching over a busy road with a towering 24.2 meters high while its top rail is at 33.9 meters long, the largest in the entire country. The main building is actually a partial replica of the original Imperial Palace built during the Heian Period but on a smaller scale. Before the heading back to our bus, we saw an enticing sign outside one of the restaurants across the street selling soft-served ice cream and decided to give it a try. One scoop of this delicious Matcha ice cream costs about Php180.00 which is totally worth it! The temple most known for its 1001 statues of Kannon, the goddes of mercy, Sanjusangendo is the longest wooden temple hall structure in Japan. It was originally founded in 1164 but rebuilt a century later when it was destroyed by fire. 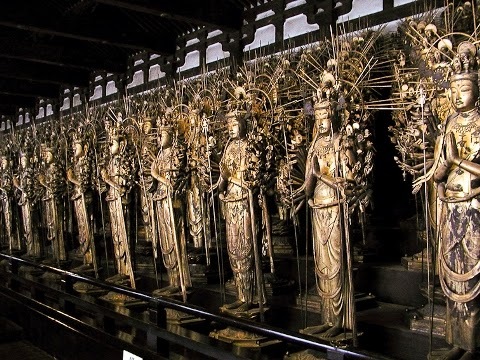 The main hall is where tourists can find a huge wooden statue of a 1000-armed Kannon surrounded by 500 human-sized statues on both sides. Perhaps the most celebrated temple in Kyoto, Kiyomizu Temple (Pure Water Temple) derived its name from Otowa Waterfall's pure water where it was built back in 780. This UNESCO World Heritage site houses the priceless statue of Kannon Bodhisattava, the goddess of mercy. Among the many charming characteristics of Kiyomizu Temple include its 13-meter high wooden veranda which offers an amazing view of the city of Kyoto, Jishu Shrine -- a shrine dedicated to matchmaking and the deity of love and the water flowing from Otowa Waterfall that pilgrims and tourists can drink for longevity, success at school and a happy love life. Leading up to the temple is the long and very busy lanes of Higashiyama District where you can find rows of specialty stores selling sweets, pottery, pickles and tons of souvenirs. The entire tour took about 10 hours that ended with the guide dropping us off at Osaka Station. So if you're planning to visit Osaka anytime soon, don't forget to include the tour of Kyoto in your itinerary to learn more of Japan's rich history and culture.